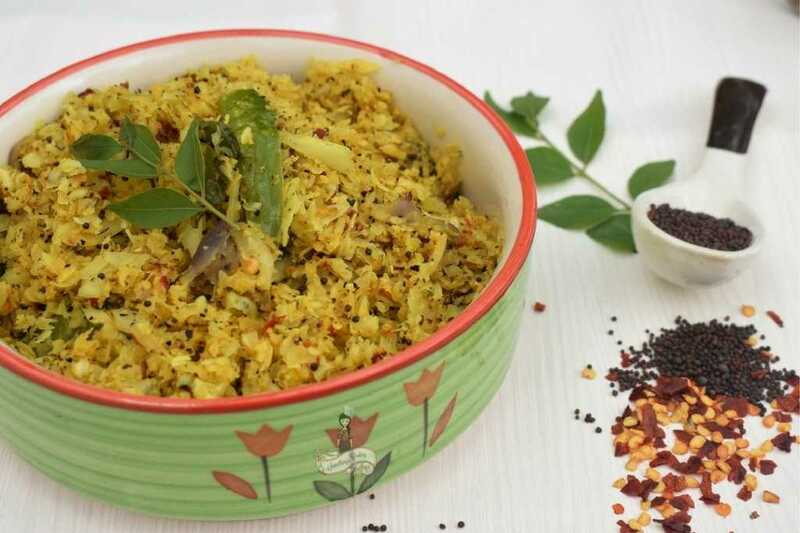 Cabbage Thoran is an everyday side for lunch in Kerala cuisine. 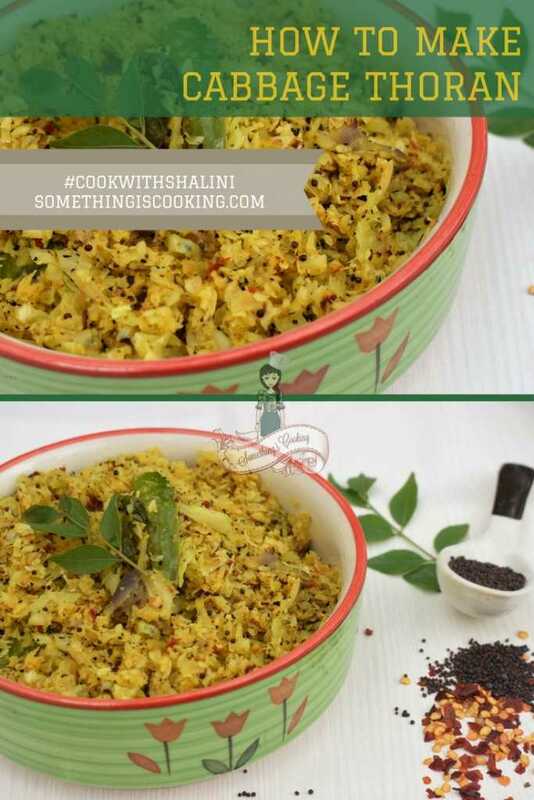 The cabbage is grated and then stir fried with crushed coconut and spices. Thoran is one of the many dishes served in Onam Sadya. Cabbage is available in abundance in every corner of our country. Known as ‘Pathagobi’ in Hindi, it is a beauty in itself to find the fresh ones stacked in local ‘subji mandi’ aka farmers market. My maid calls it ‘bandhgobi’ as the leaves are wrapped together and closed to hold its shape. Ha! As a kid, I hated this vegetable (Well, I hated almost all the vegetables. But that’s another story!) because of the faintest smell it leaves on the dishes. The only way Mom could make me eat this one was by adding it on veg fried rice. I used to then gorge it like crazy. I add Crushed red chillies or Chilli flakes and a dash of Cumin powder. It’s heavenly! You ought to try it. In a pan, add oil and splutter mustard seeds. Add curry leaves, shallots and green chillies. Sauté for a couple of seconds. Add grated Coconut and Chilli flakes. Mix well. Add grated cabbage, mix, cover and cook for about 5 minutes. Stir and cook for another 2 minutes. Add Cumin powder and mix well. 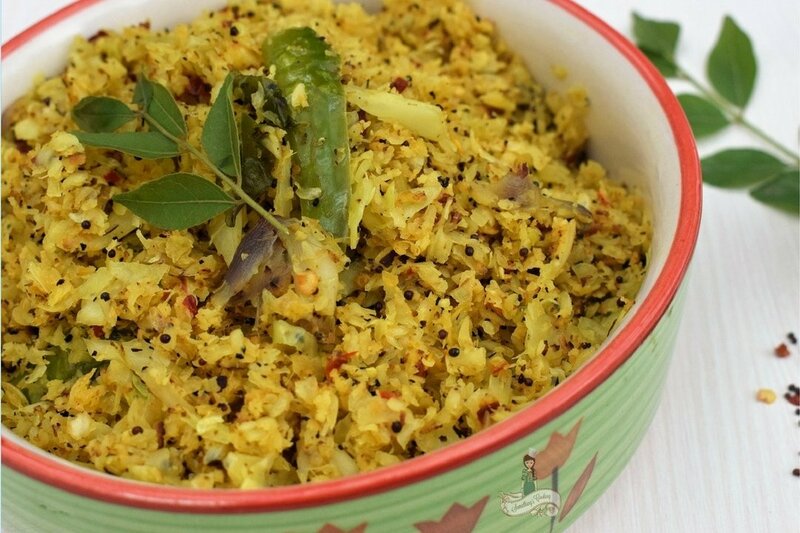 Serve hot as a side with rice and Sambar. Love this one? Pin it for later! 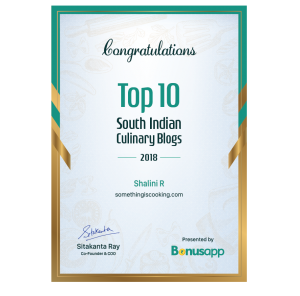 Check out other Thoran recipes on the blog made from Carrot, Beetroot, amaranth leaves and anchovies. 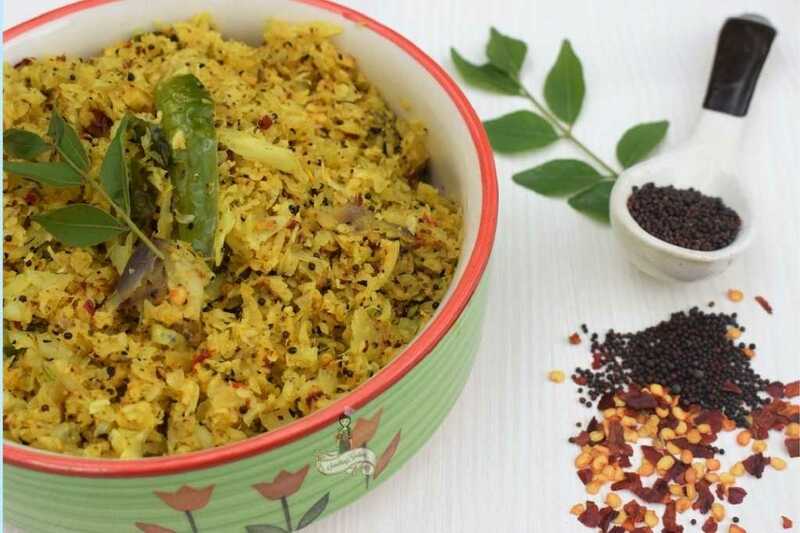 Cabbage thoran or any thoran for that matter is delicious! But instead of using dry red chilles or flakes I use fresh green chillies that I blitz with the coconut in the mixer and add it to the dish once almost cooked. Cabbage was one of the few veggies I did not hate. I loved it in fried rice, but could tolerate it in most dishes, even when it was the dominant ingredient.